A male California quail perched on top of a fence post in Point Reyes National Seashore. This quail is from the same trip as my previous post of the peeking sparrow, and I found the quail along the road to Drake's Beach. 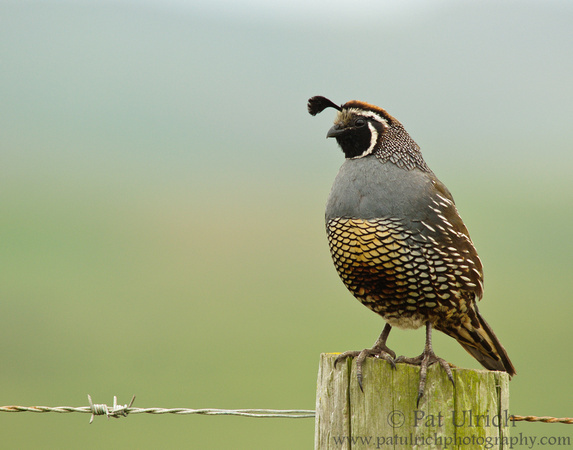 I have often seen quail dotting the fence posts along Sir Francis Drake Boulevard on my way to the outer reaches of the Point Reyes Peninsula, but it was fairly uncommon to see them along the short road to Drake's Beach. Perhaps its because there is not as much scrub vegetation out there, as its mostly pastures. California quail are of my favorite species to photograph -- view more photos of these lovely birds in my Quail Gallery. wow, that's gorgeous! makes me want to draw him, but he's also very intimidating with all those gorgeous feather patterns! so THIS is the feathered-friend on your header! Very handsome, and unique I'd say. Wonderful capture. Your quail photographs are always spectacular! Quails are especially beautiful subjects with their lovely plumage. Stunning detail, color and clarity, as always. Nice photo Pat. A male quail has saved many a day for me. Fun how one small element in the photo gets your eye busy looking for similar shapes and add so much to a photo… I'm referring to the barbs on that taught fence wire. Without those I wouldn't notice the pin feathers on the bird's forehead, his long toenails fit for scratching in the dirt, the pointed little hook on his top beak, the occasional dark tail feather, nor the dark central shaft of each of his breast and neck feathers. Pretty awesome!